In late 2004, an undersea megathrust earthquake occurred off the west coast of Indonesia when the Indian Plate was subducted by the Burma Plate, triggering a series of devastating tsunamis along most landmasses bordering the Indian Ocean. The earthquake and subsequent tsunamis killed over 230,000 people in 14 countries, plowing through coastal communities with waves up to 100 feet high. With a magnitude of 9.1–9.3, it was the third-largest earthquake ever recorded. In 2011, another undersea megathrust earthquake occurred off the coast of Japan, producing powerful tsunami waves that reached over 130 feet. 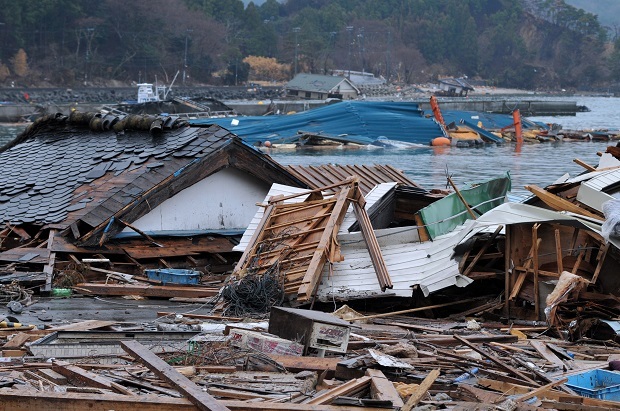 With a magnitude of 9.0, the earthquake and tsunami that followed caused 15,891 confirmed deaths, 6,152 injuries, and left 2,584 people missing. It was the most powerful earthquake to ever hit Japan and the fourth-largest earthquake ever recorded. When North Americans talk about “The Big One,” they’re often referring to the earthquake and subsequent destruction that is assumed to eventually take place along the San Andreas Fault. But, just north of the California’s most famous fault line is the lesser known and far more insidious Cascadia subduction zone running 750 miles from Vancouver to Northern California. As Kathryn Schulz reported for The New Yorker earlier this week, this somewhat mysterious fault is nearly three quarters of a century overdue for a massive earthquake, estimated to be anywhere between 8.0 and 9.2 in magnitude. The most alarming question to come from all of this data is not “if” but “when” as geologists can now guarantee that this catastrophe of colossal proportions is on its way. By the time the aftershocks have stopped and the water has receded, “the region will be unrecognizable.” Kenneth Murphy, who directs FEMA ’s Region X, the division responsible for Oregon, Washington, Idaho, and Alaska, says, “Our operating assumption is that everything west of Interstate 5 will be toast.” In the Pacific Northwest, everything west of Interstate 5 includes Seattle, Tacoma, Portland, Eugene, Salem, Olympia, and over seven million people. When the Cascadia earthquake and tsunami occurs, that region will have suffered the worst natural disaster in the history of North America. Survivors will be few, and the landscape of the United States will be changed forever.